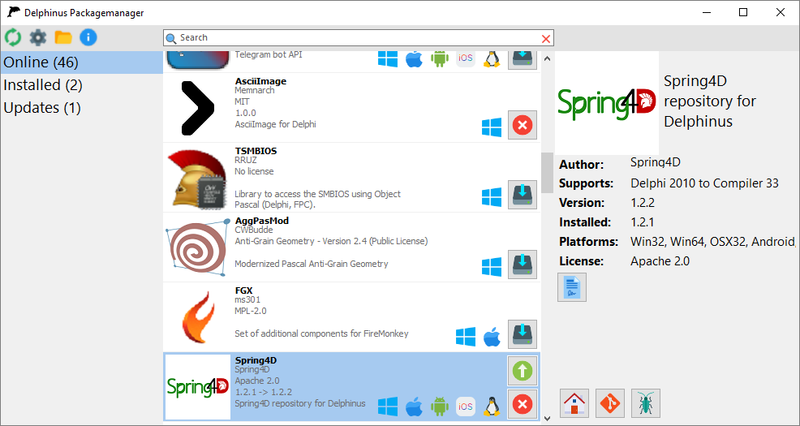 Delphinus is a Packagemanager which runs right from your Delphi IDE (XE and Newer). It is community driven and allows you to install/manage Components without worrying about all the different installationsteps you usually take when installing one or more components. It displays detailed information about each Package and shows when an update for an installed component is available. Who do i need to contact to get my own Package online? In short: Nobody! You can do it yourself! How do i get/install it? Hi author, great project delphinus, but why I have error with message “RateLimit Exceeded.Wait for Reset”? The current number of repositories already exceeds the number of calls Delphinus can do to the anonymous Github-Api. You’ll have to provide a OAuth-Token linked to a Github-Account.